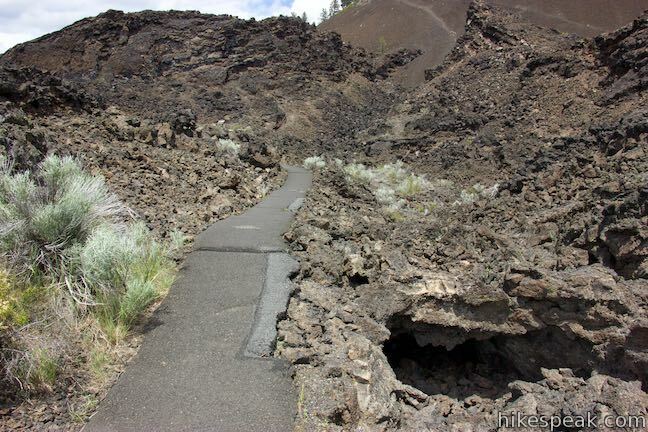 You’ll be grateful to find pavement and not melting hot lava on Trail of the Molten Land. 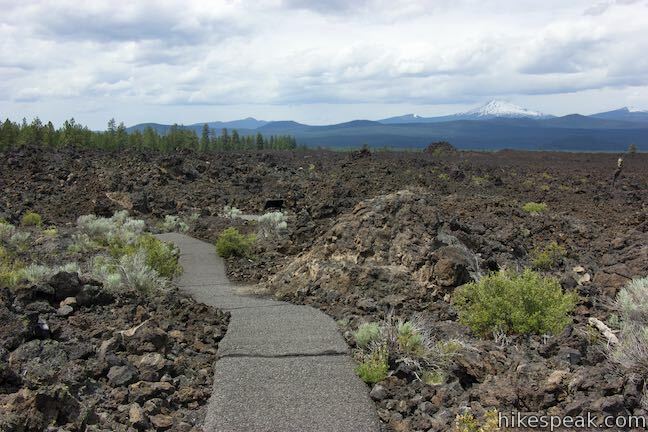 This impressive trail is built atop a barren landscape of dark volcanic rock, the Lava Butte Lava Flow in Newberry National Volcanic Monument, which is part of Deschutes National Forest. 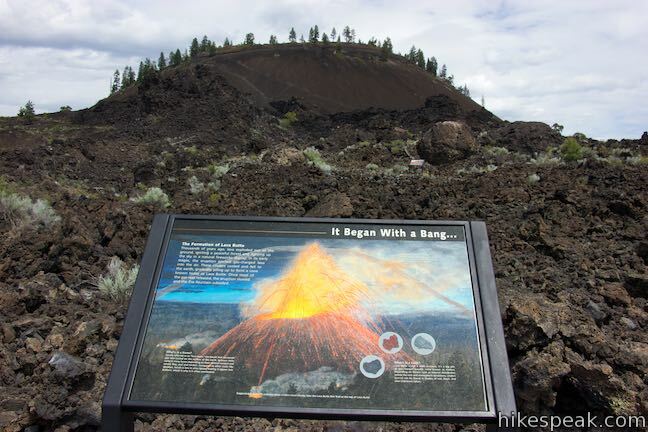 Panels along the trail provide information about how the lava flow began at Lava Butte, a cinder cone above the trail. 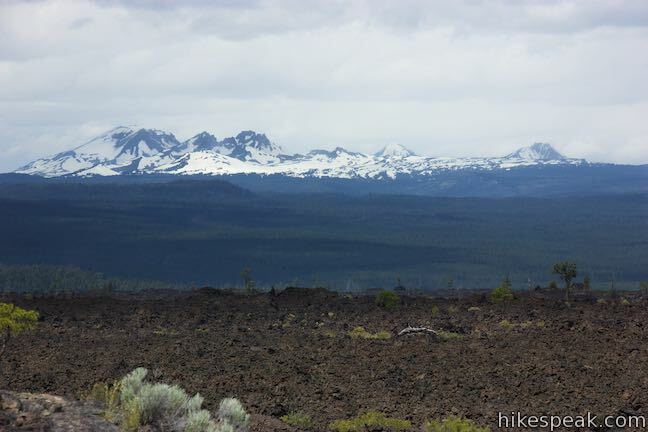 An overlook at trail’s end offers excellent westward views of the Cascade Mountains. 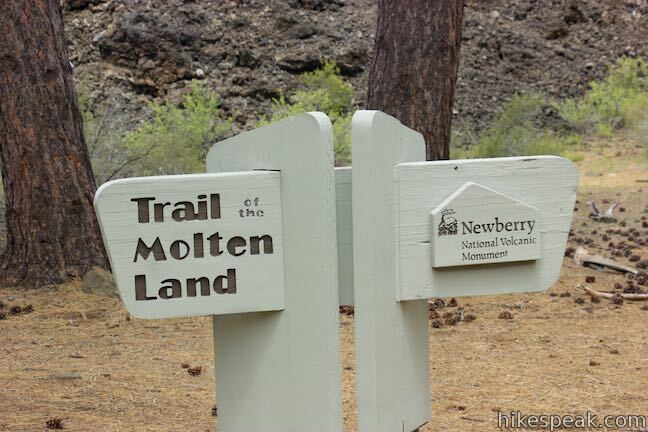 Trail of the Molten Land is a 1.1-mile long partial loop with 135 feet of elevation change. 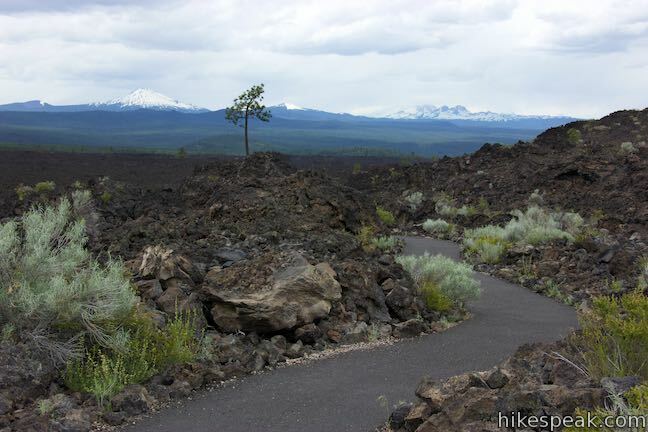 Leaving from the back of Lava Lands Visitor Center, which is just off Route 97 south of Bend, Oregon, your hike will be about 1.25 miles round trip. To learn about the area’s plants, put nearby Trail of the Whispering Pines on your path for a 1.6-mile outing. 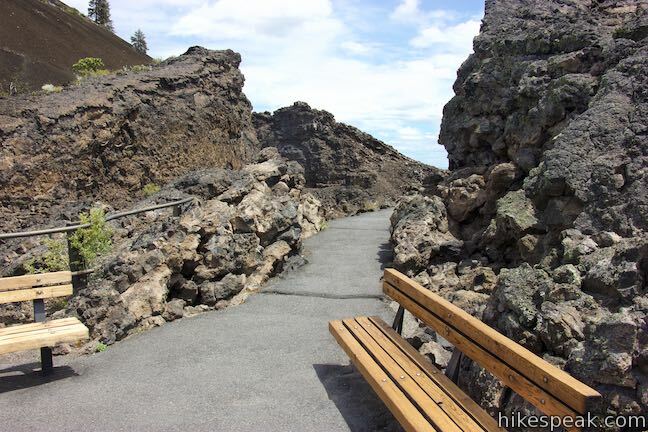 Walk out the back of Lava Lands Visitor Center, where a collection of benches offer your first view of Lava Butte Lava Flow, a rock wall at the cusp of the hardened lava flow. Turn right and take steps down to a paved path. Follow this path northeast through a pine forest to a junction. 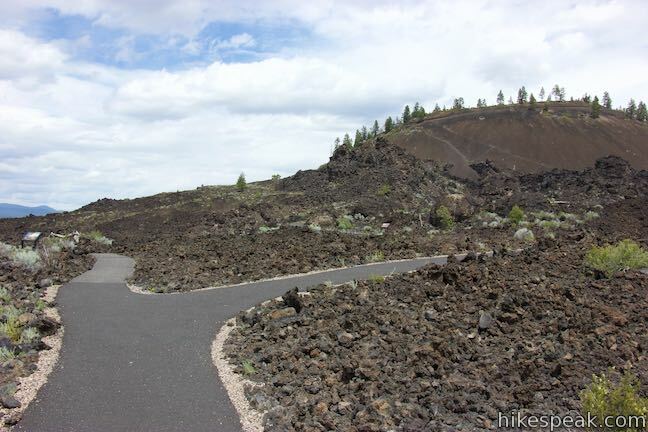 A trail to the right goes to the parking area on the north side of the visitor center. 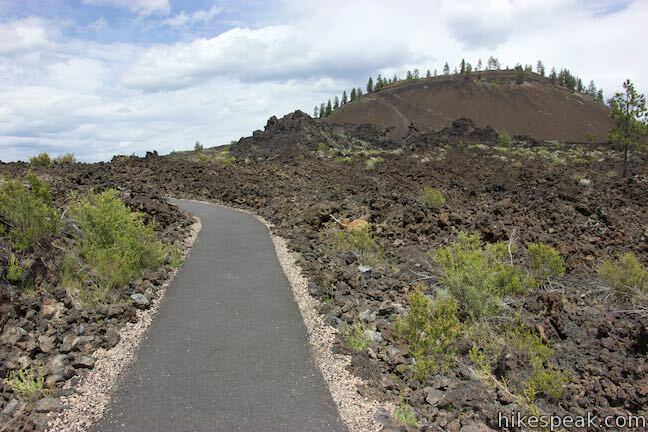 Stay to the left to curve your way north to the start of Trail of the Molten Land, which is about 100 yards from Lava Lands Visitor Center. The junction is marked with a big wooden sign. A trail to the left connects to Trail of the Whispering Pines. Turn right to begin up Trail of the Molten Land. You are about to enter a world where lava dominates the landscape and living things must adapt to a harsh environment. 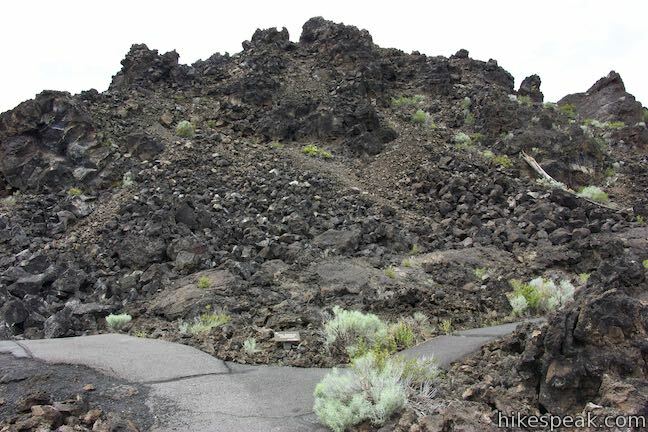 The Trail of the Molten Land provides insights into the formation of Lava Butte (the cinder cone you see in the distance), as well as close-up views of many unique features of this lava flow. It also shares the survival stories of local high desert plants and animals trying to make a living here. 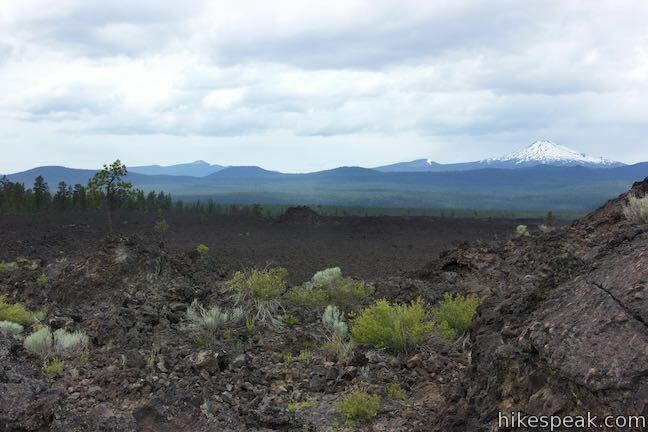 Imagine standing here 7,000 years ago as a wall of molten lava bulldozed toward you, engulfing the forest in flames. Although it reached temperatures over 1,200 degrees Fahrenheit, the flow was cooling as it moved, causing it to break into chunks and blocky pieces. 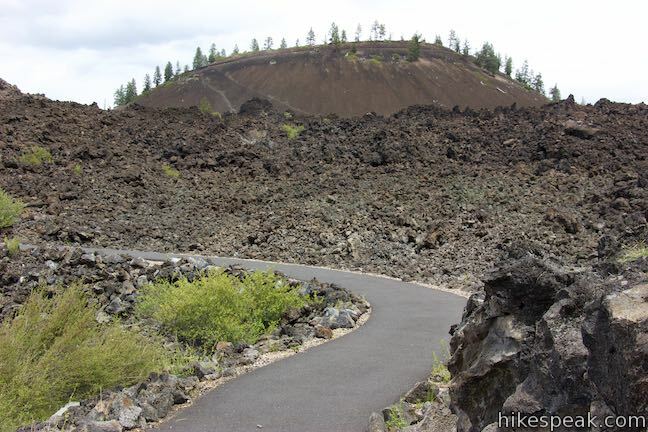 Gravity drew the lava flow away from the forest by the visitor center, sending it downhill to the west toward the Deschutes River. 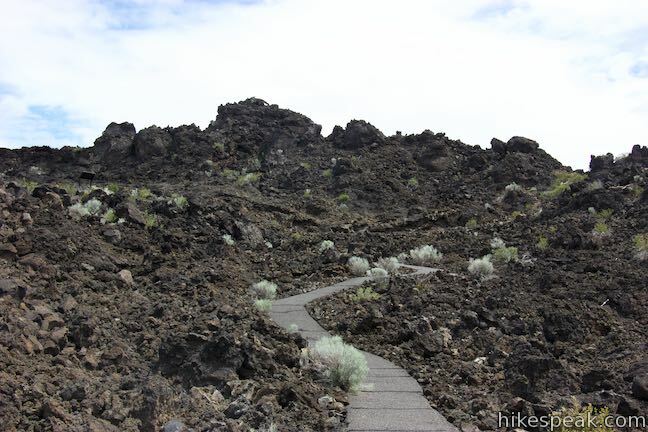 Continue up the trail and it will take you up onto the lava flow. The trail makes a big curve to the left followed by a big curve to the right. 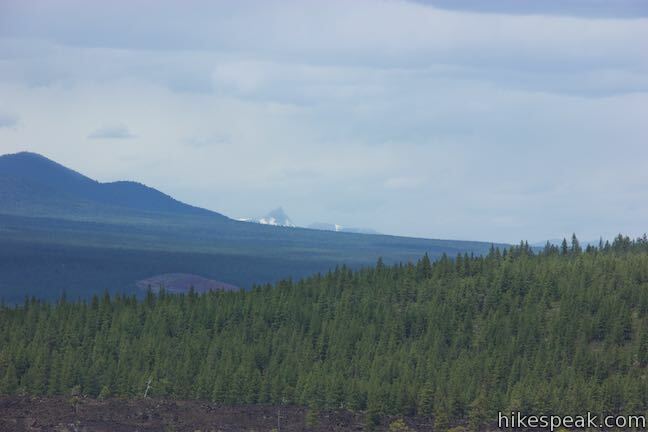 As you pass through lava rocks, look north toward Lava Butte and west toward Mount Bachelor and the Cascade Mountains. 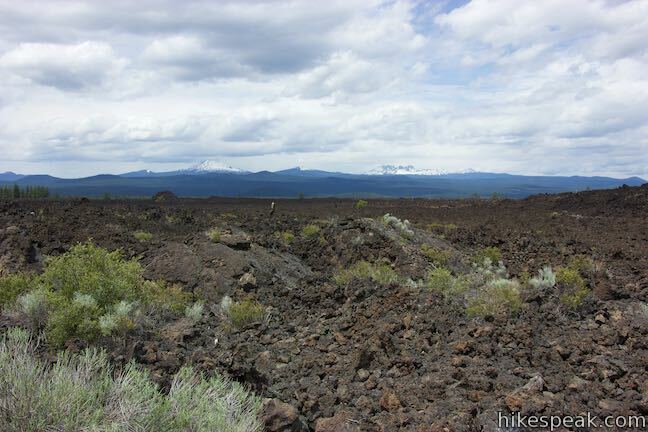 Around 7,000 years ago, lava burst through a thin spot on the south side of Lava Butte. Lava flowed out of this “Breach” and split into three main gutters. 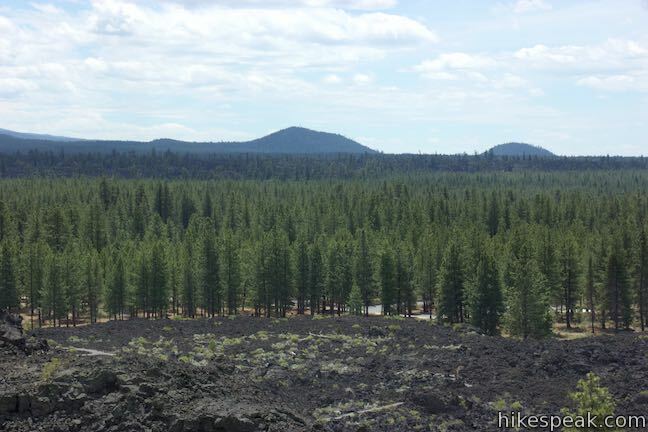 Lava spread across the land, burying 9.5 square miles of pine forests with basaltic rocks. 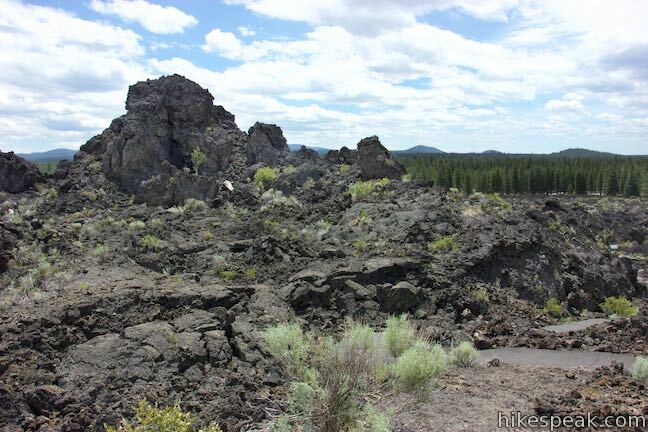 Lava Butte Lava Flow also blocked the path of the Deschutes River, rerouting it over cascades and waterfalls. 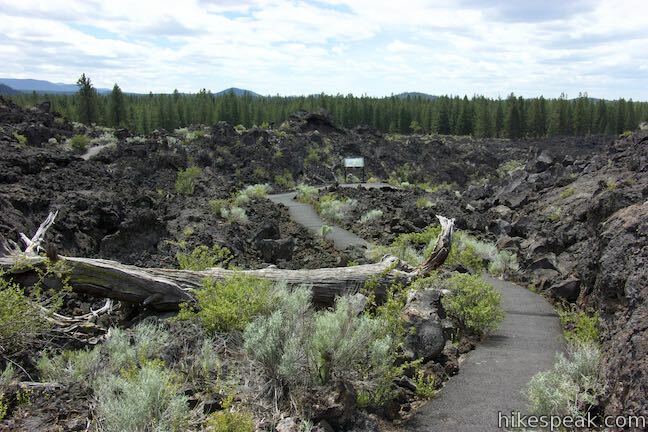 Walk down Deschutes River Trail to Benham Falls to see how the river passes along the border of the lava flow and cuts into barriers of basalt. 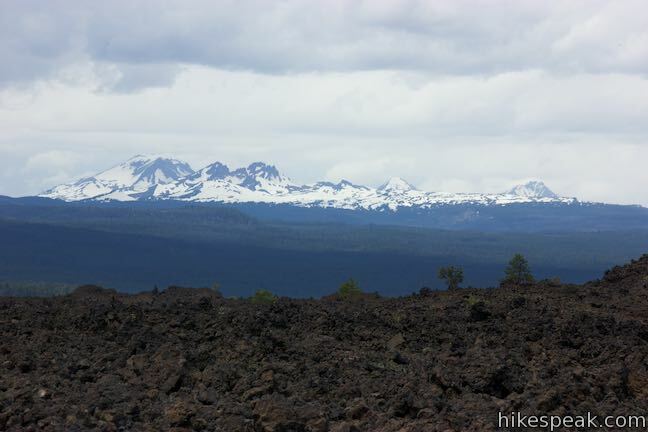 Believe it or not, those giant boulders in front of you started as just small chunks of molten rock. As these pieces broke off the sides of the molten river channel, they rolled and tumbled through the flow, growing in size as they moved – Much like a snowball rolling downhill and growing larger as more snow sticks to it. 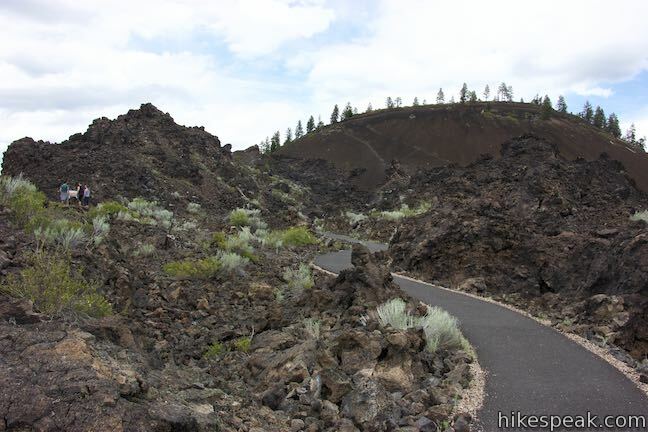 As you continue up the trail, you are following the path these lava balls took thousands of years ago. 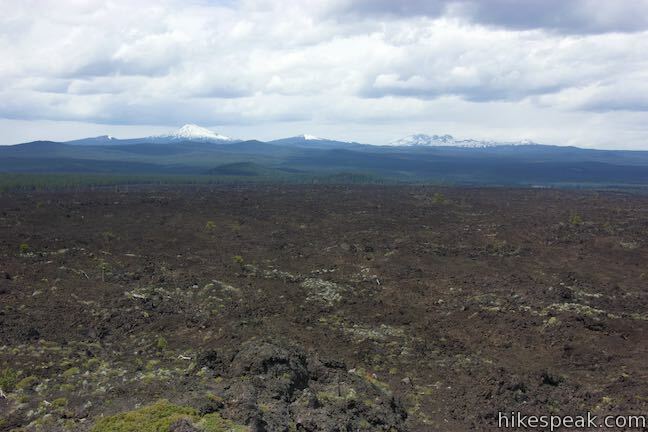 You are standing on the edge of one of the largest volcanoes in North America. 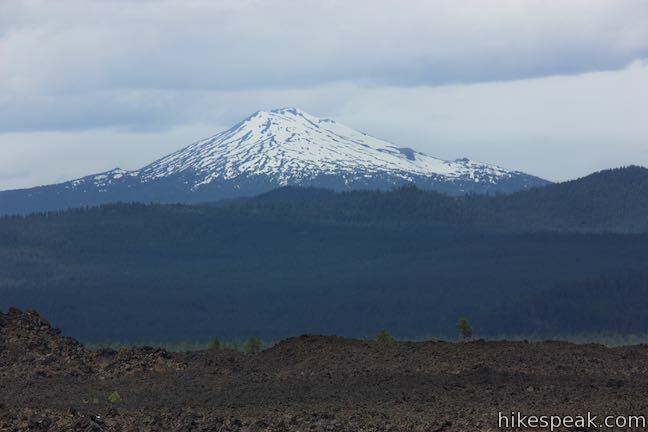 Resting between the Cascades to the west and the High Lava Plains to the east, Newberry Volcano and its apron of lava flows cover nearly 1,200 square miles (the size of Rhode Island!). 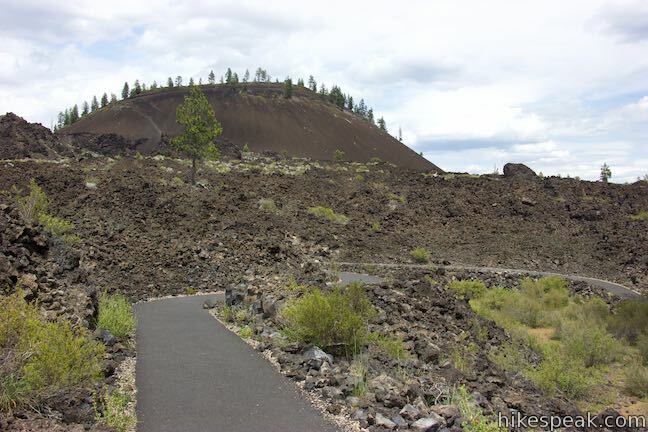 With scores of eruptions dating as far back as 400,000 years ago and a recently as 1,300 years ago, Newberry has had a measurable impact on Oregon and the surrounding lands with deposits from its most explosive eruptions reaching as far as Idaho to the northeast and San Francisco Bay to the southwest. Though the surface appears calm, deep underground magma is working toward the surface. 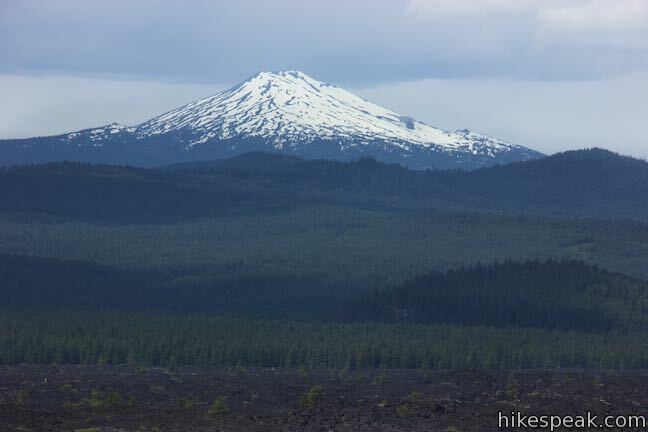 While it is sleeping today, Newberry Volcano could reawaken and devastate nearby towns and forests with fiery eruptions. 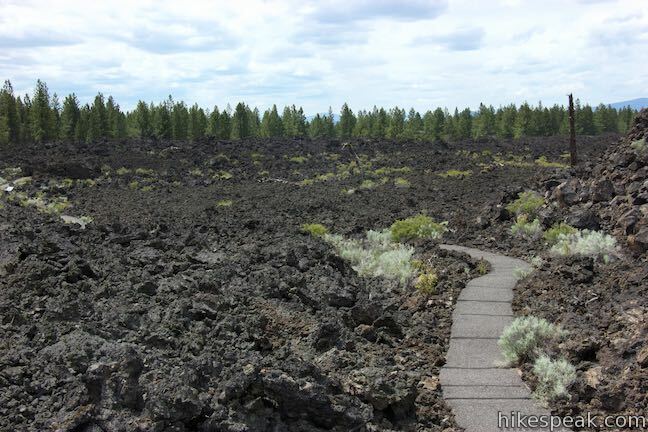 Push that thought out of your mind and continue walking casually up to an overlook spur, a third of a mile from the start of Trail of the Molten Land. This is the end of the wheelchair-friendly portion of the trail, as undulations in the terrain become greater from this point on. 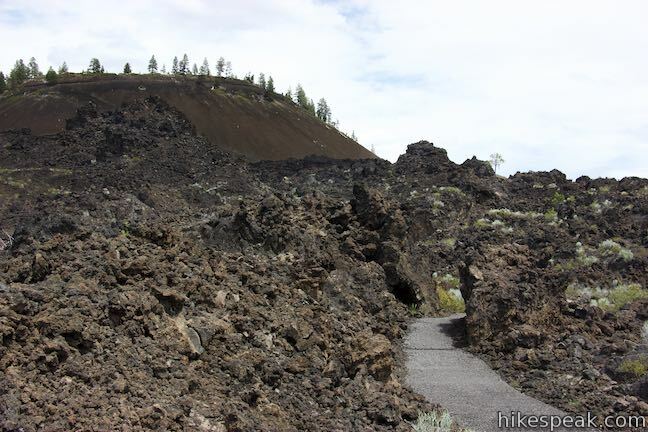 Before you proceed up the trail, pop over to the left to check out a vista over the lava flow. 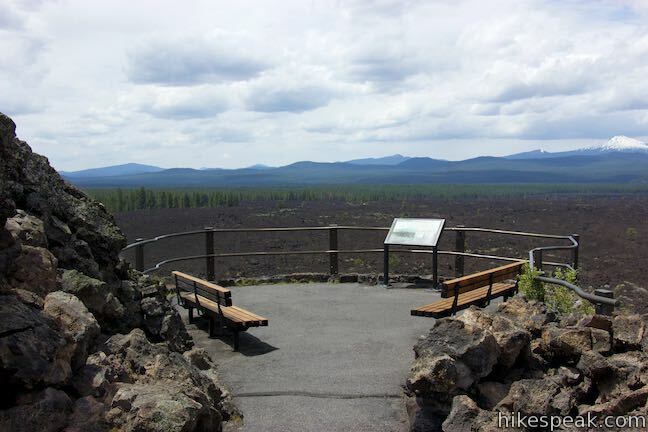 This overlook is placed at the edge of the main channel that poured from the butte. 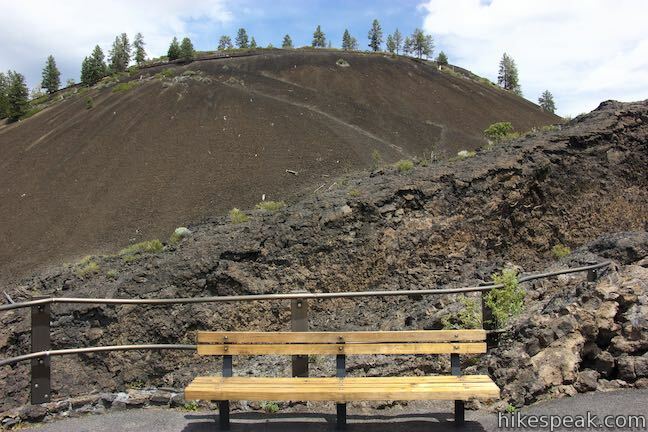 As a river of fiery lava filled the valley in front of you, pulses in the river of lava overflowed the channel and deposited layers of hardened material on the bank for the channel, the current location of this perch. Hike another 0.05 miles up the trail to hit the junction at the north end of the loop. Save the other half of the loop for later and turn right at the junction, following a sign that puts Phil Brogan Viewpoint at 350 yards away. 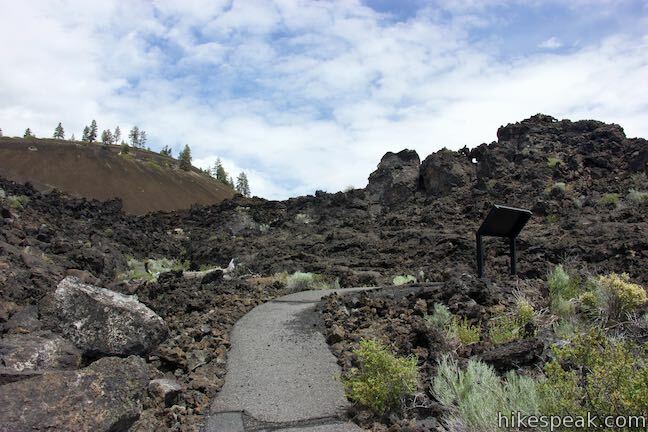 Hike up this branch of the trail, passing through uneven terrain in the old lava flow. 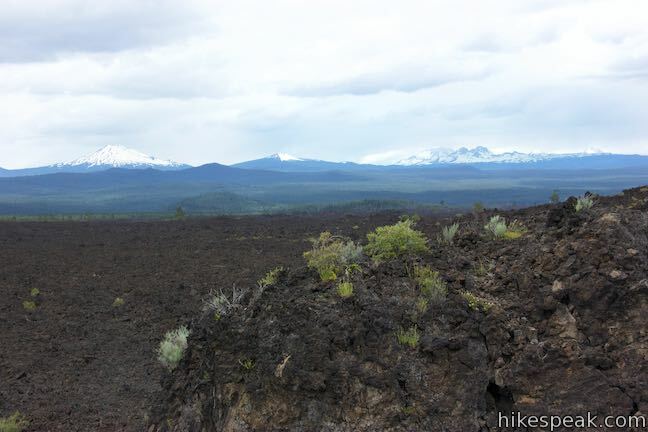 Bordering the trail, you’ll find a shelf in the basalt, with a pocket beneath it. 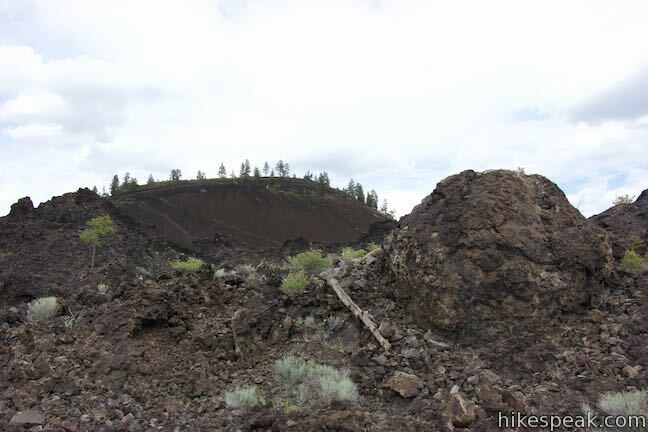 This is a remnant of a lava tube. 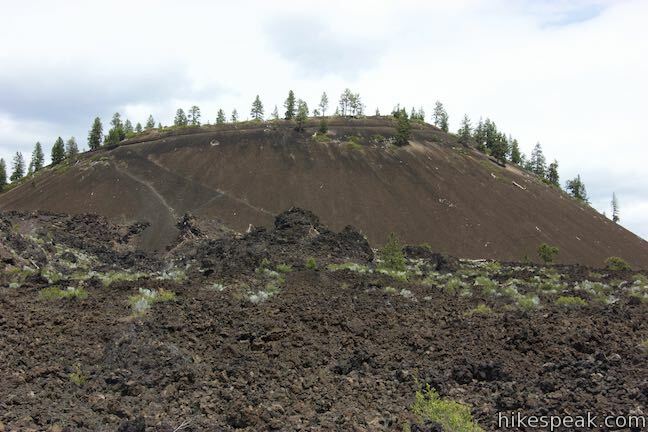 A panel explains that lava tubes are usually found in pāhoehoe flows. 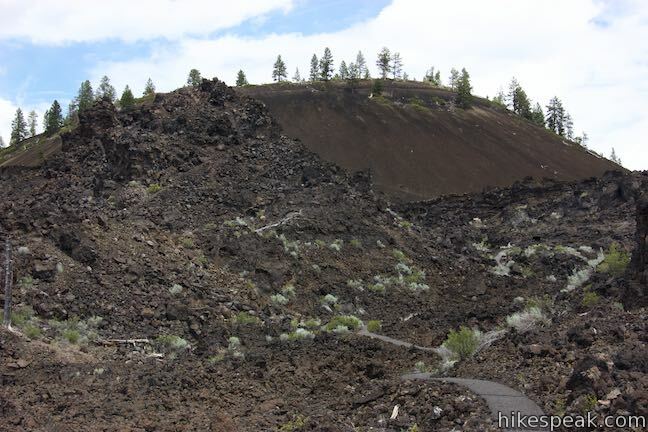 Pāhoehoe is a Hawaiian word for lava that is very fluid with smooth or ropy surfaces. 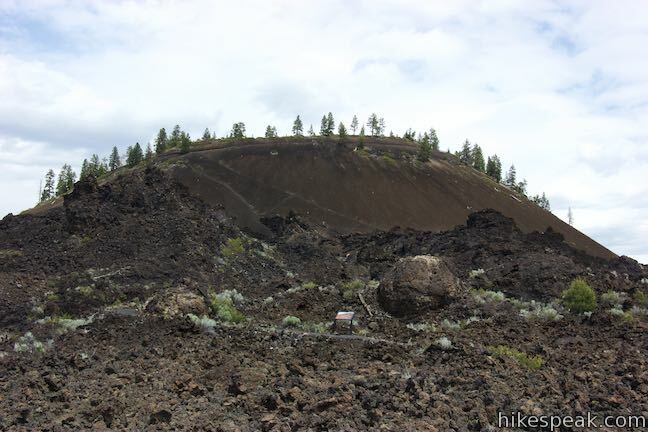 When the eruption from “the Breach” on the side of Lava Butte began to wane, the flow in the channel slowed and cooled. The surface hardened first and the lava below continued to flow, leaving an empty tube behind. When the roof of the tube was too thin, it later collapsed, as you can observe along Trail of the Molten Land. 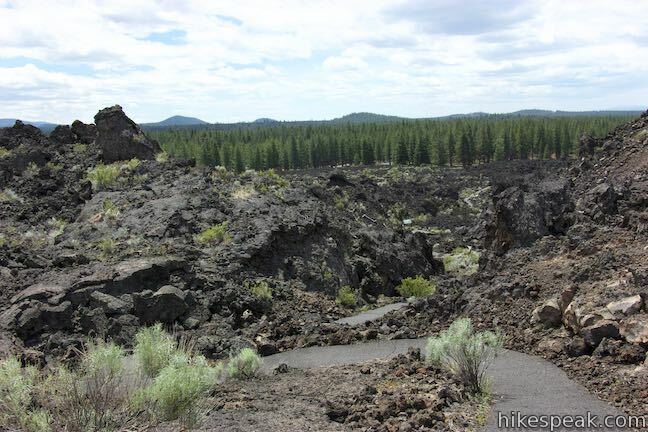 To see a much longer enact cave, check out nearby Lava River Cave. 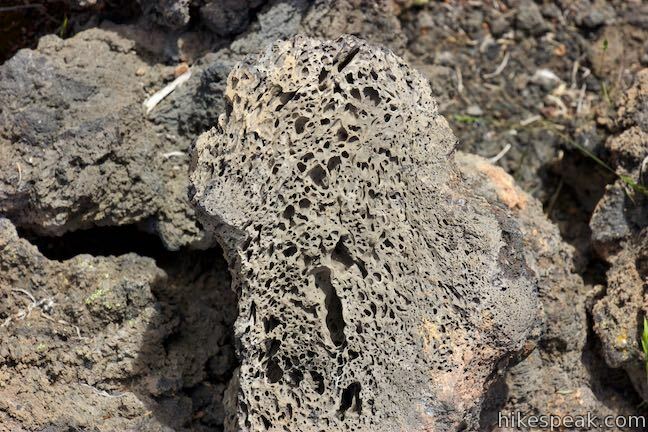 The next panel explains that the lava flowing from the breach initially behaved like a fluid pāhoehoe flow, “oozing like a thick syrup.” The lava evolved into an ‘a‘a flow that acted “more like molten bulldozers, knocking down everything in sight.” ‘A‘a lava rocks have more sharp broke edges than the smooth-flowing pāhoehoe. 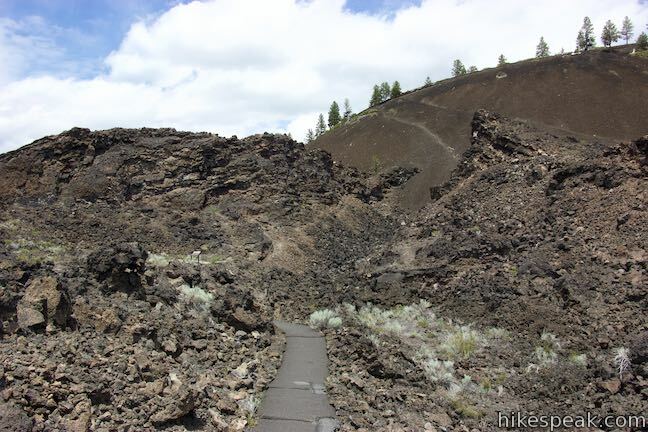 Keep hiking and you’ll come to the trail’s closest point to “the Breach” on the side of Lava Butte, where lava burst out some 7,000 years ago. 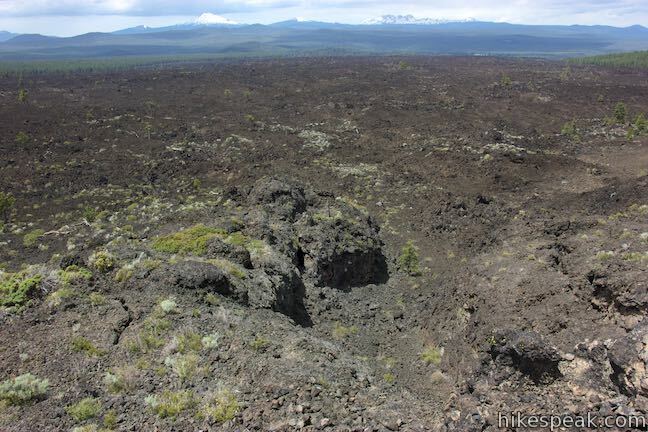 The lava that poured out of the breach covers 9.5 square miles and is up to 100 feet deep. 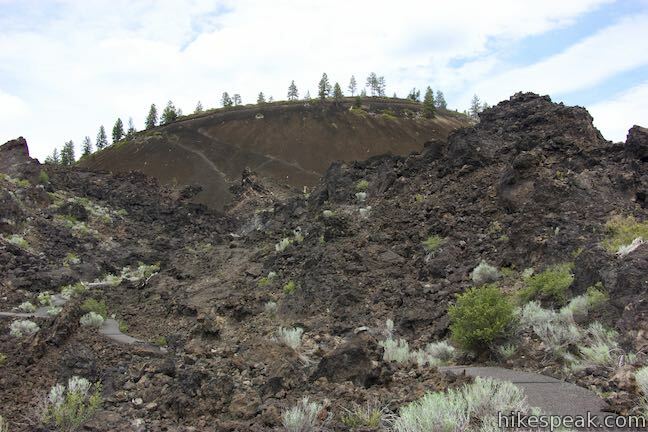 The flow produced enough basalt to built a four-lane highway around the earth 6 times. That’s a lot of lava! 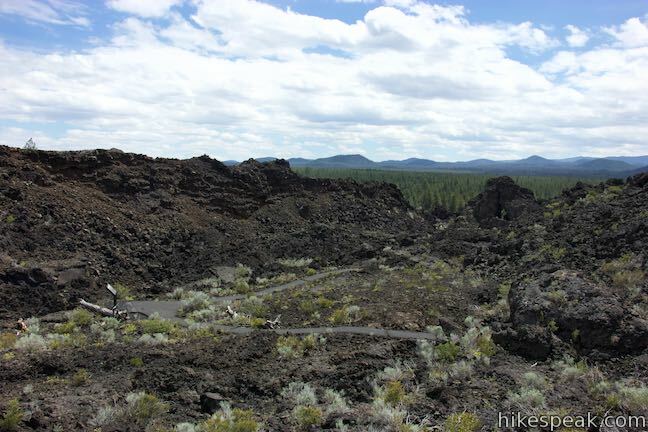 To get a top-down view of Lava Butte Lava Flow, check out Lava Butte Trail. 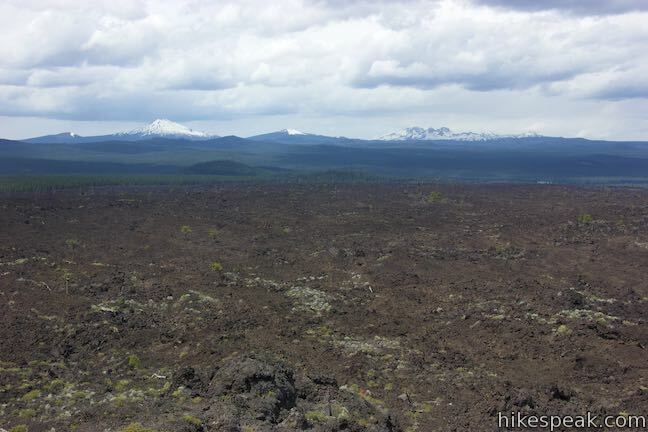 The Trail of the Molten Land snakes through this rough basaltic landscape up to Phil Brogan Viewpoint, which is positioned atop a shelf in the lava flow with open views to the west. 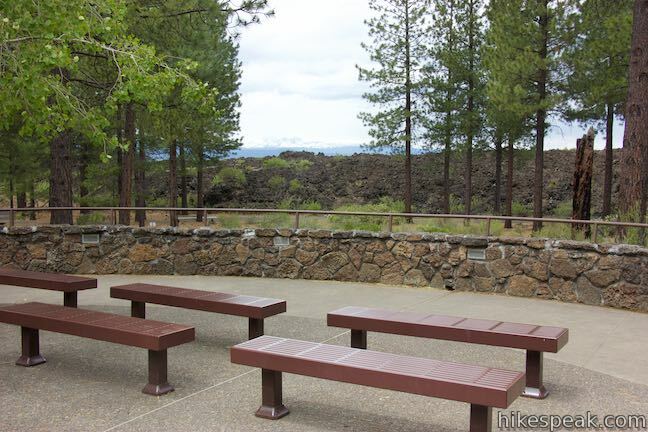 Take a seat on one of the benches at this trail-ending overlook and admire the Cascade Mountains. 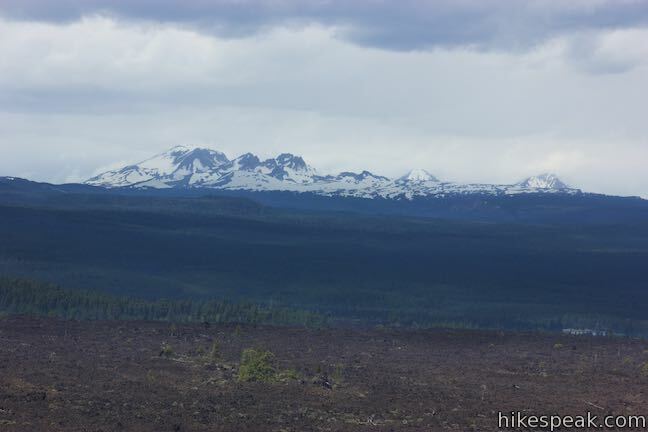 Going from north to south, the notable snow-capped summits in view are North Sister, Middle Sister, Broken Top, South Sister, and Mount Bachelor, rising to 10,985 feet, 10,047 feet, 8,175 feet, 10,358 feet, and 9,068 feet respectively. 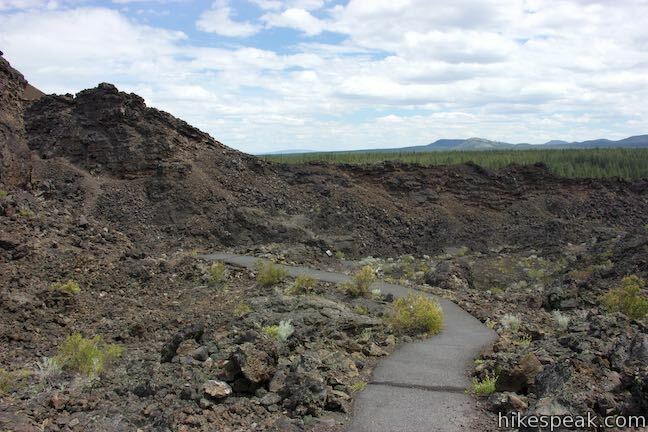 Phil Brogan Viewpoint is 0.55 miles from the start of Trail of the Molten Land and the return distance is the same length. 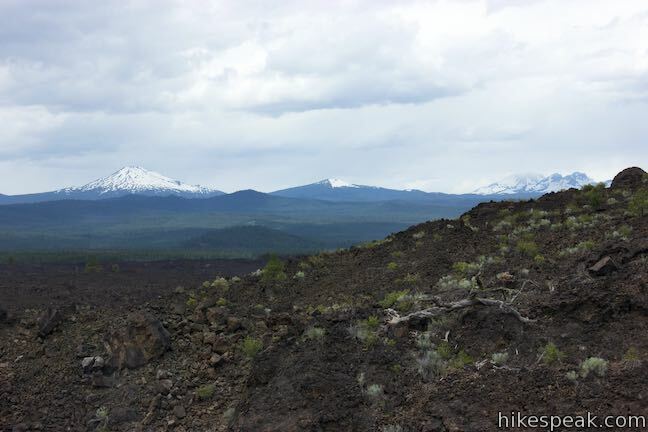 When you are ready to leave the viewpoint, hike 0.17 miles back down the trail to the junction and turn right to continue with the loop. The second part of the loop in Trail of the Molten Land has four more info panels. 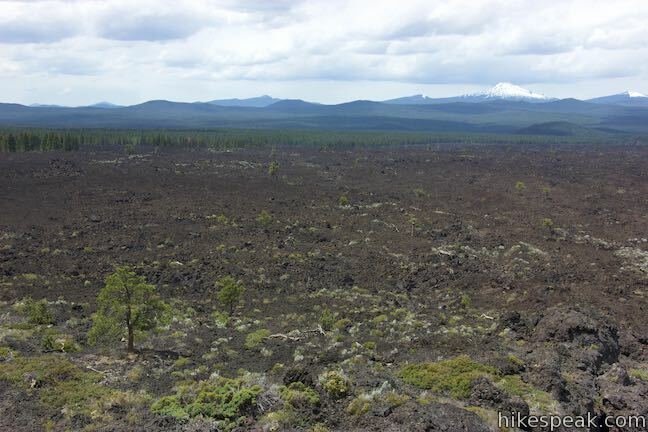 The first comes just past the junction and describes plants that have adapted to life on the lava flow. 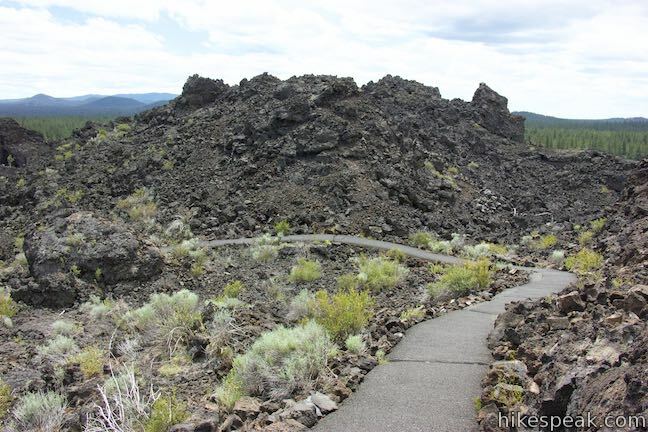 Use this panel to identify the scarce vegetation along the trail, like sulfur buckwheat, gray rabbitbrush, Oregon sunshine, Hotrock penstemon, mountain spray, Davidson’s Penstemon, and wax currant. 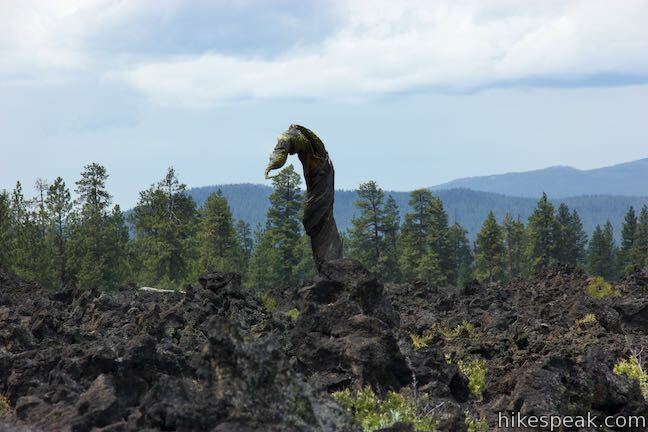 The next panel highlights a twisted old tree trunk, creatively called the Lava Ness Monster. The tree trunk resemble the most iconic photo of the Lock Ness Monster. 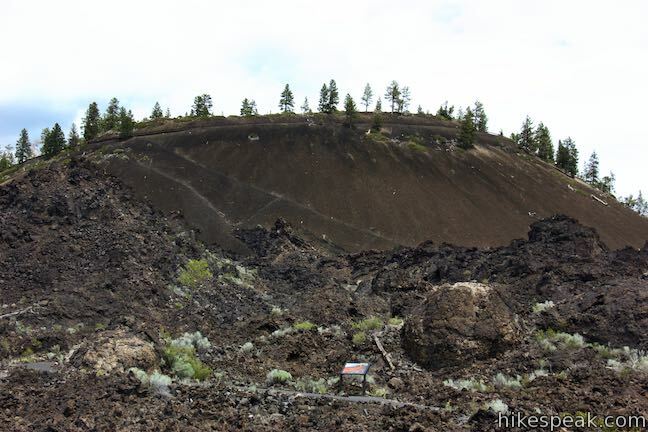 The mystery explained by the panel is how did this tree end up on the lava flow? Lava Ness was once just a pine seed that found its way into these unforgiving molten lands. 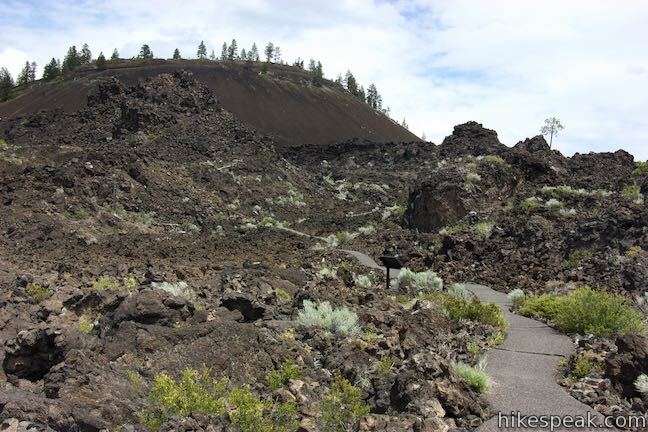 Though the lava cooled over 7,000 years ago, there is little soil here because the dry climate doesn’t weather the rocks quickly. These plants adapt to living on a small pocket of soil by sending out a single moisture-seeking taproot. The fluids and nutrients are then distributed to all sides of the tree by growing in a spiral fashion. In more favorable environments, where all roots reach water and soil, trees grow straight and roots feed the branches directly above them. Here in the arid Molten Lands, this spiral growth allows the uniform watering of all the branches across the trunk, even if only one root grows on one side of a tree. The tale of the Lava Ness Monster is actually the tree’s tap route, which found water while other roots could only anchor the tree in place. Snap a photo of this legend-inspired tree and the Cascade Mountains beyond. 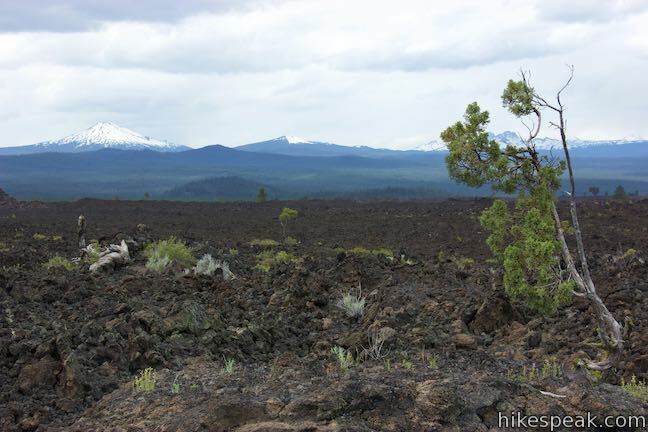 If you are wondering if actual animals live on Lava Butte Lava Flow, the answer is yes. The next panel highlights some of the fauna in the lava. 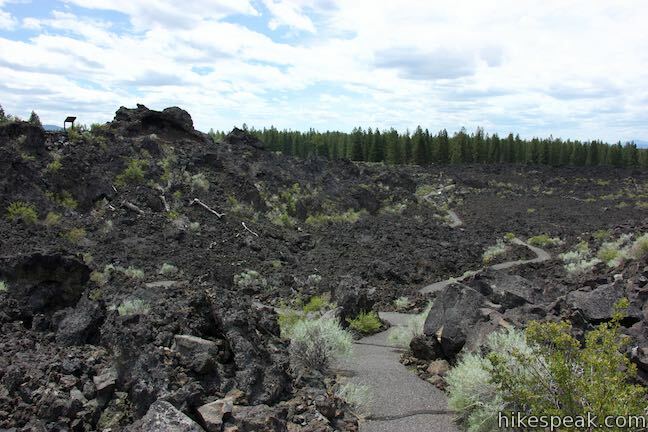 As you come to the end of the loop, you’ll pass one last panel with a vivid depiction of the creation of Lava Butte that preceded Lava Butte Lava Flow. 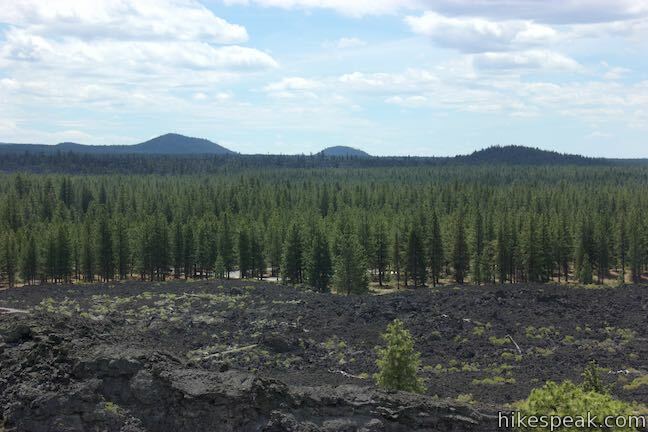 Thousands of years ago, lava exploded out of the ground, igniting a peaceful forest and lighting up the sky in a natural fireworks display. In its early stages, the eruption ejected gas-charged lava into the air. 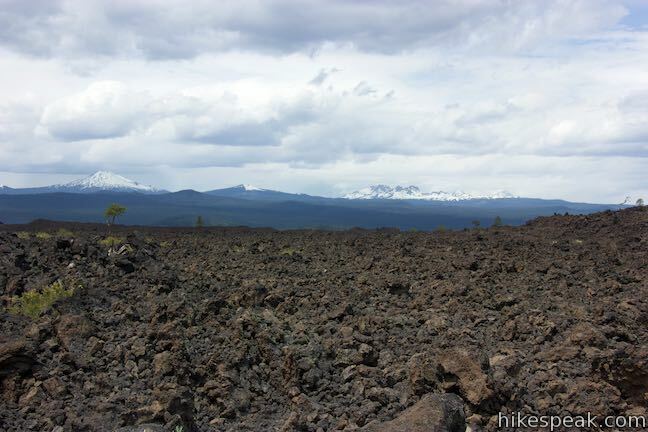 These cinders cooled and fell to the earth, gradually piling up to form a cone known today as Lava Butte. Once most of the gas released, the eruption slowed and the fire fountain subsided. 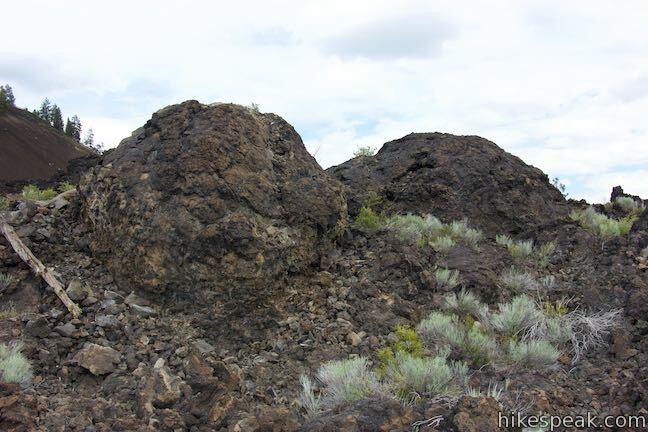 Lava Butte is not a solid structure. 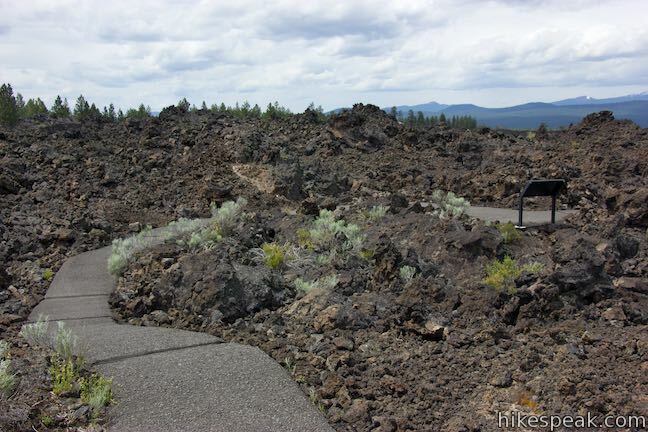 it’s a big pile of gas-charged basaltic rocks known as cinders. 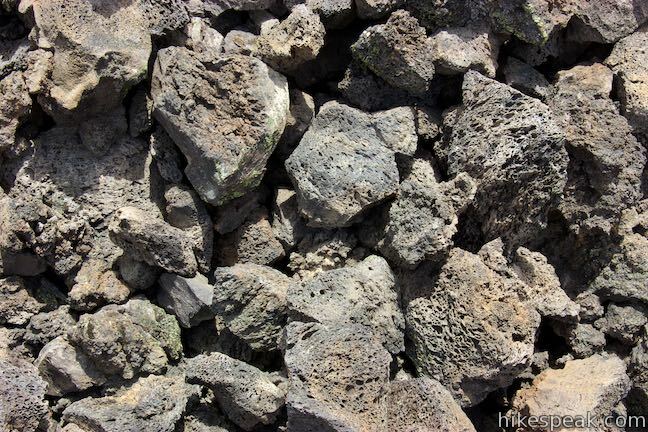 Depending on factors such as mineral distribution within the rock and atmospheric conditions, cinders can be found in shades of red, black, and even iridescent colors. Come to the junction at the close of the loop and bear right to hike back toward the visitor center. Repeat the initial 0.18 miles to come back to the start of Trail of the Molten Land. 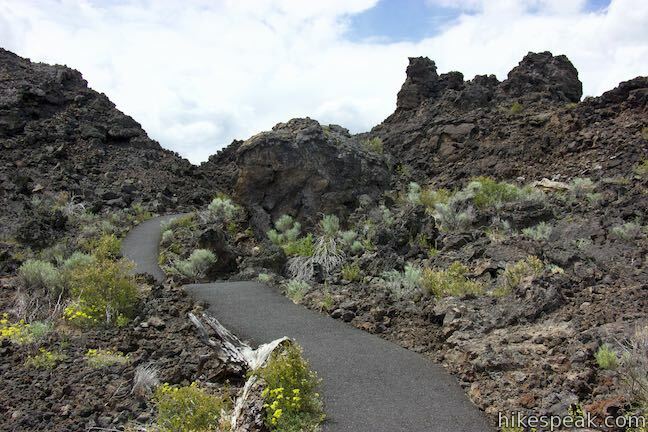 If you bear left, you could hike a short distance back to Lava Lands Visitor Center. The trail to the right takes a longer way back to the visitor center, passing the start of Trail of the Whispering Pines after 100 yards. 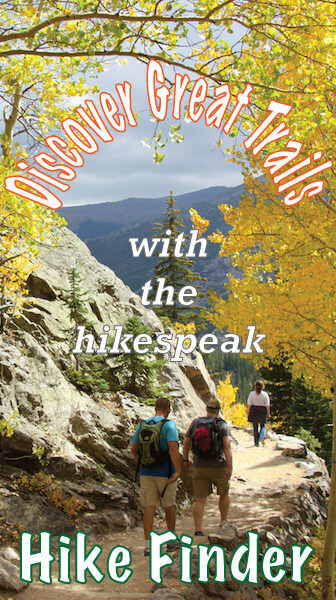 This trail comes with a guide that highlights some of the area’s plants. 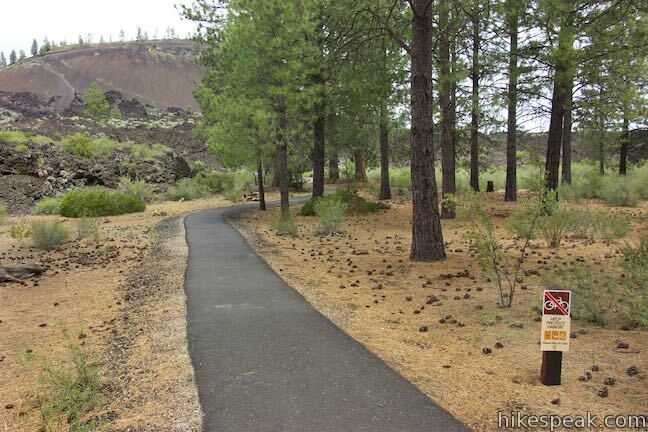 Hiking Trail of the Whispering Pines after you’ve completed Trail of the Molten Land brings the total distance to about 1.6 miles. 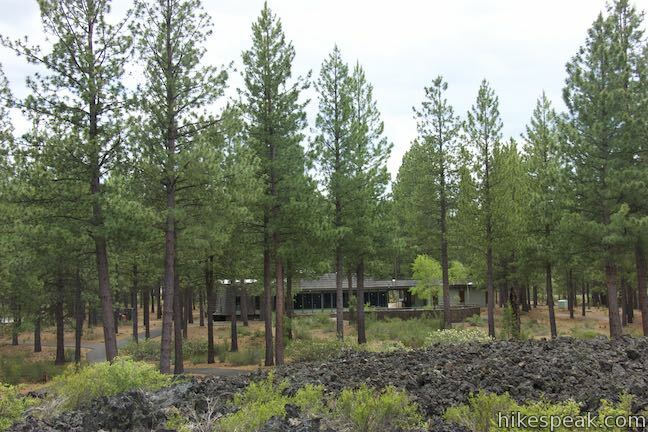 Lava Lands Visitor Center is open from the May through October. 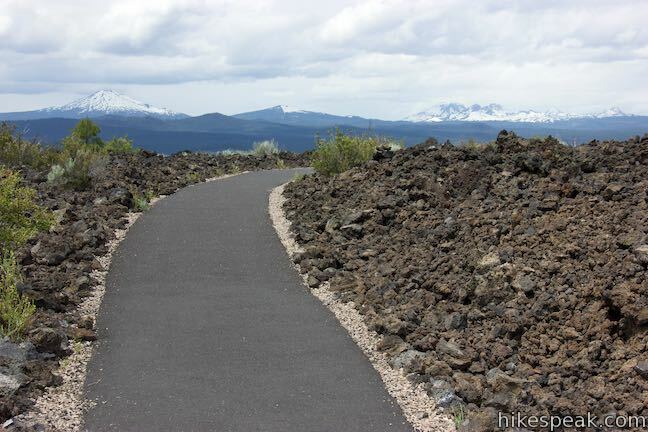 Trails remain open in months when the visitor center is closed. 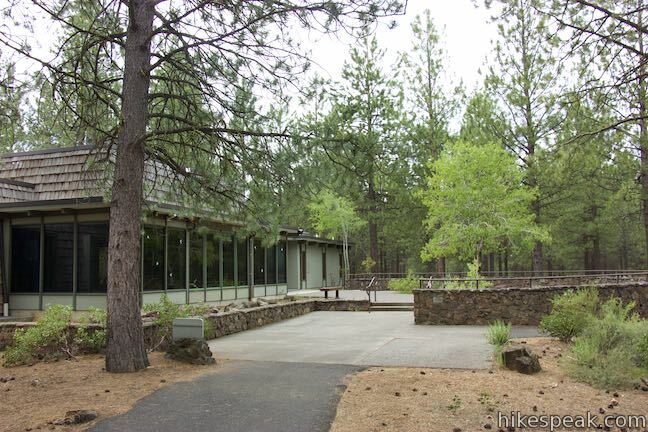 A day use fee is charged during the season when the visitor center is open. The fee is $5 per vehicle (as of 2016). 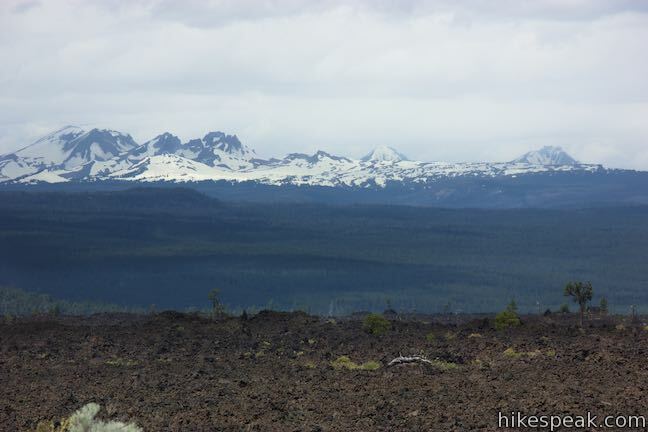 A Northwest Forest Pass or America the Beautiful public lands pass can be used in place of the day use fee. 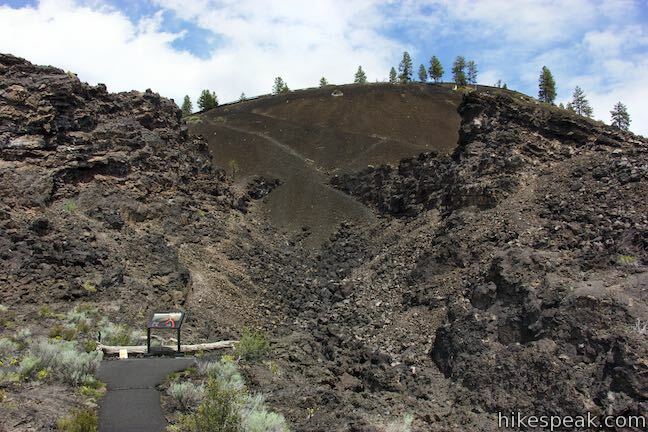 The parking area southwest of Lava Lands Visitor Center remains open year-round and is open in the morning and evening even when the main entrance is closed. 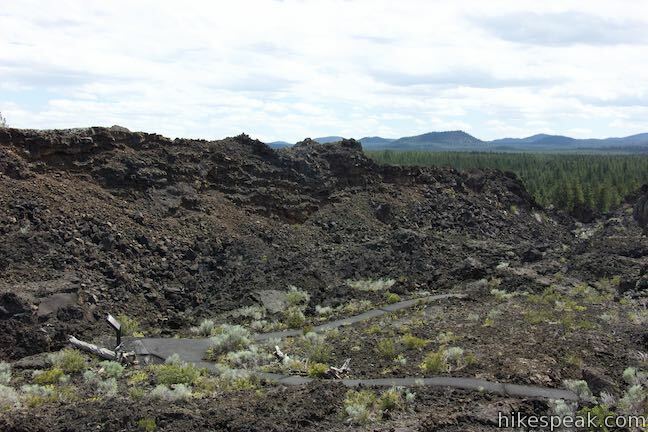 Bikes are allowed on Trail of the Whispering Pines but are forbidden on Trail of the Molten Land. Dogs are welcome on leashes. 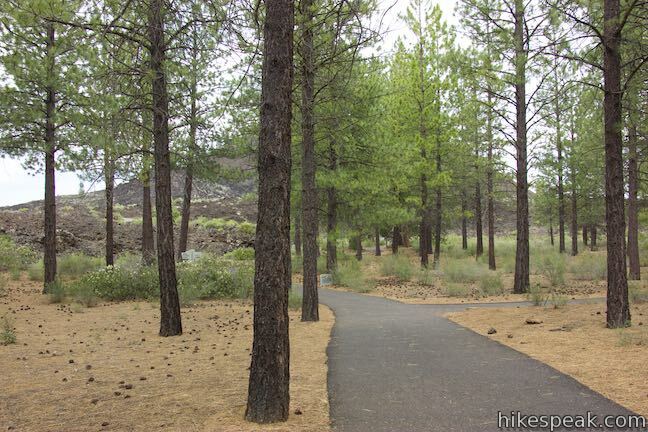 No permit is required for Trail of the Whispering Pines, so get out and enjoy! 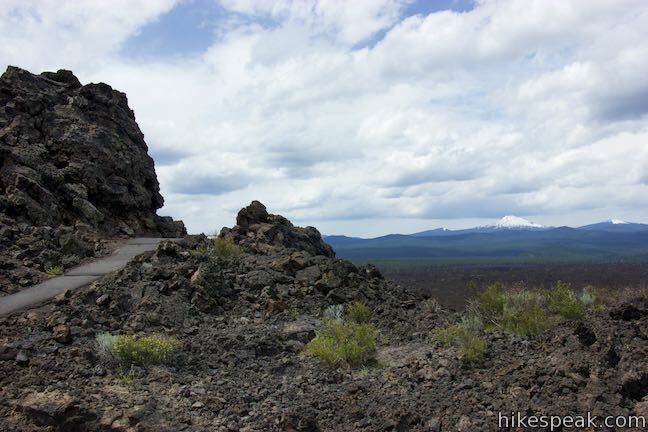 To get to the trailhead: From Bend, travel south on US 97 for 11 miles. 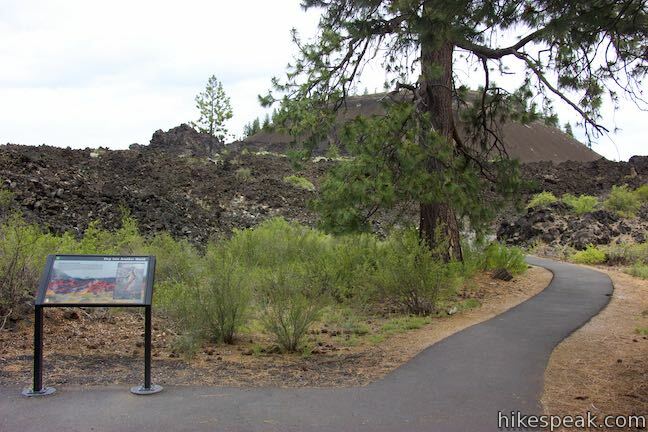 Take the Crawford Road exit, following a sign for Lava Lands Visitor Center and Benham Falls Trailhead. 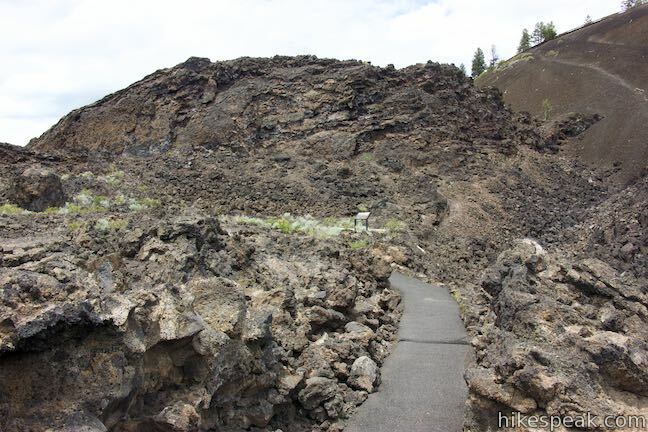 At the end of the offramp, come to an intersection and turn right to reach the entrance gate by Lava Lands Visitor Center. 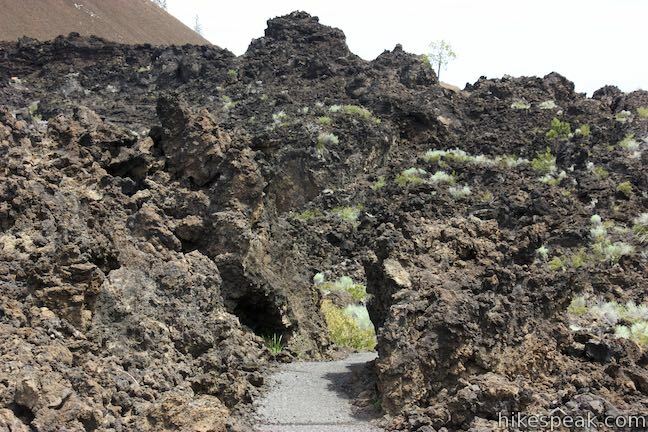 If that entrance is closed, drive another tenth of a mile down Crawford Road and turn right into the always-open parking area on the southwest side of Lava Lands Visitor Center. 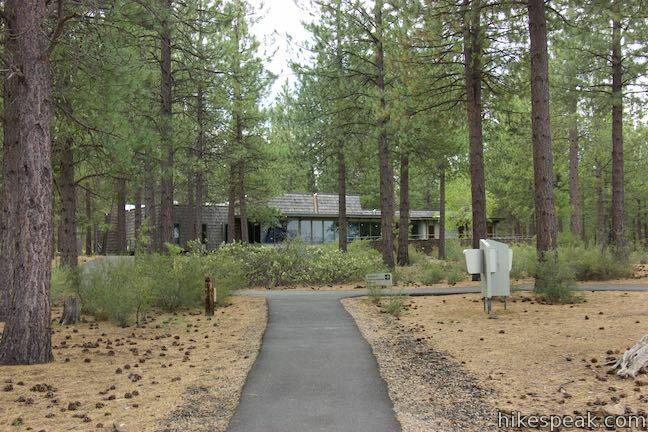 From Sunriver, take US 97 north to exit 151. At the bottom of the offramp, turn right on Cottonwood Road and drive 2 miles to Crawford Road. Turn right for the main entrance or turn right for the off-hours parking. These photos were taken in May of 2016. Click to enlarge. 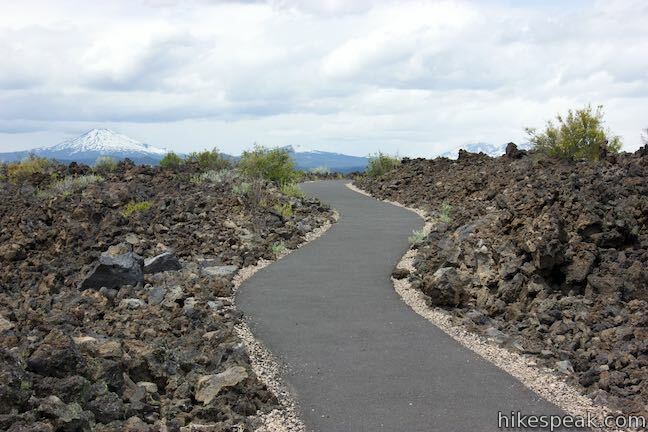 This interpretive botanical trail explores high desert plants on the edge of Lava Butte Lava Flow on a quarter-mile long path. 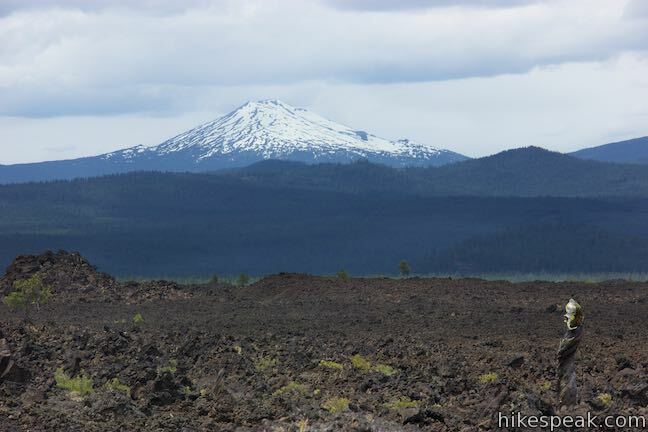 This hike explores a cinder cone with a fire lookout tower and a crater-circling trail that offer panoramic views over Lava Butte Lava Flow and the Cascade Mountains. 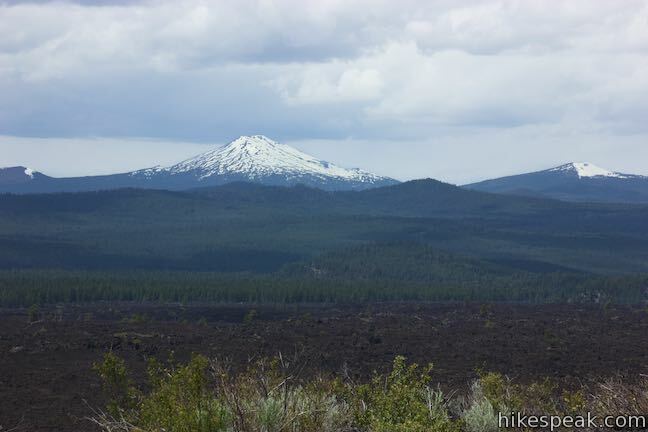 This 1.9-mile hike follows a leisurely trail along the Deschutes River to aggressive cascades called Benham Falls where the river churns and tumbles through a gap between cliffs. 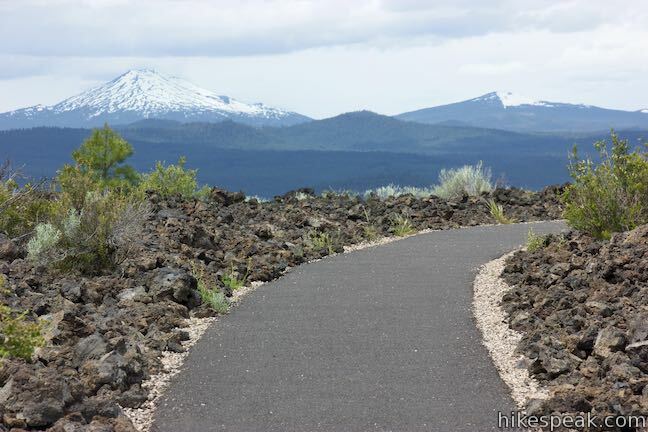 See Bend's best waterfall on a short walk to a downstream viewpoint or a half-mile round trip hike to an overlook by the top of the falls. 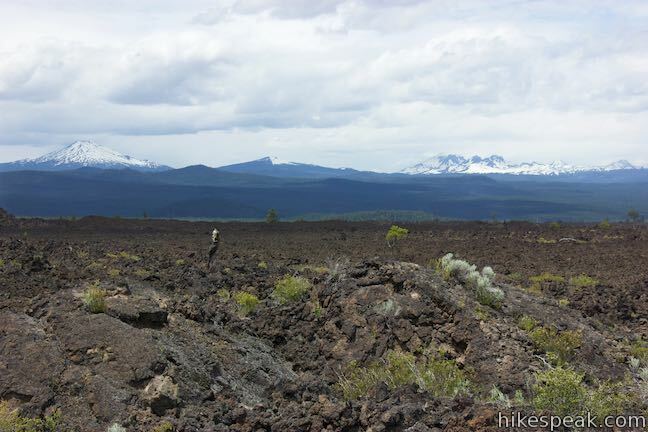 This 7.4-mile circuit ventures above Tumalo Falls and explores numerous other waterfalls and cascades on Tumalo Creek, combining North Fork Trail, Swampy Lakes Trail, and Bridge Creek Trail. 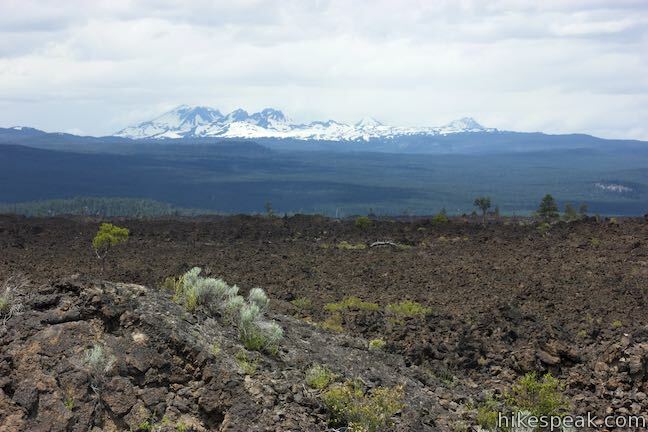 Explore other hikes in Central Oregon, the Columbia River Gorge, and elsewhere.